Easily clean buttons, nobs, vents, radios, speakers, seams, crevices and more! Looking for the perfect brush to clean around pesky buttons, nobs, vents, radios, speakers, seams, and any other hard to reach interior surface? Look no further than the Vent and Dash Boar's Hair Detailing Brush! It's a gentle yet effective cleaning tool and the extremely soft bristles allow you to break up contaminants in those tough to reach areas while never scratching or marring the surface. The handle is made of high quality ferrule that measures at 9.87 inches long. This makes for great durability, easy grip, and maneuverability. 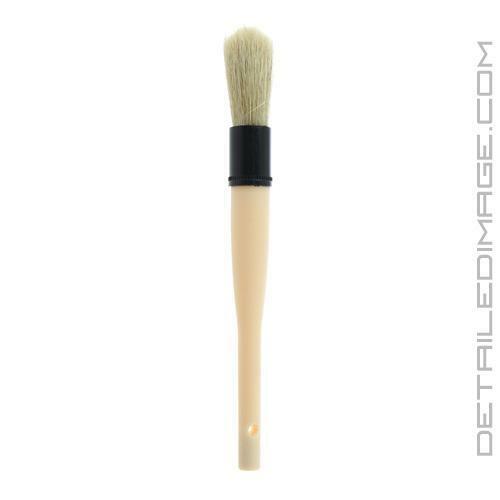 The bristles are made up of soft natural boars hair and they measure a generous 2.5 inches long, which allows them to easily fit into those hard to reach areas mentioned before. Try the Vent and Dash Boar's Hair Detailing Brush today and keep those hard to reach interior areas clean! Great brush for interior work. It's soft, so as not to scratch, yet firm enough to force its way into the vents and crevices and sweep out the dirt and dust. I thought the handle was a little excessive in length, but then I used it and it's very comfortable and more maneuverable then I expected. Wish I had purchased sooner. This is one of the best brushes that I have in my arsenal. I use it dry to brush dust away from the dash, nav screen, cluster, and vents. It is very soft, and light which prevents it from adding scratches to the cluster. Definitely a must-have. Nice and soft. Work in tight small areas that need cleaning.